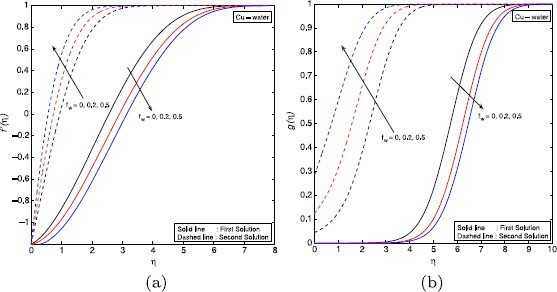 The paper discusses the effects of homogeneous-heterogeneous reactions on stagnation-point flow of a nanofluid over a stretching or shrinking sheet. 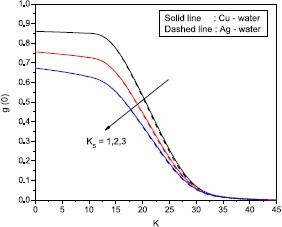 The model presented describes mass transfer in copper-water and silver-water nanofluids. The governing system of equations is solved numerically, and the study shows that dual solutions exist for certain suction/injection, stretching/shrinking and magnetic parameter values. Comparison of the numerical results is made with previously published results for special cases. Problems involving fluid flow over stretching or shrinking surfaces can be found in many manufacturing processes such as in polymer extrusion, wire and fiber coating, foodstuff processing, etc. Crane  was the first to consider the steady two-dimensional flow of a Newtonian fluid driven by a stretching elastic flat sheet which moved in its own plane with velocity varying linearly with the distance from a fixed point. This study was subsequently extended by many authors to explore various aspects of heat transfer in a fluid surrounding a stretching sheet (Tsou et al. , Erickson et al. , Mucoglu and Chen , Grubka and Bobba , Karwe and Jaluria , Chen , Abo-Eldahab and El-Aziz , Salem and El-Aziz , Ali , Ishak et al. ). The magnetohydrodynamic effect has important engineering applications in electrical motors. Heat transfer over a stretching or shrinking sheet subject to an external magnetic field, viscous dissipation and joule effects was studied by Jafar et al. . They observed that the flow and heat transfer characteristics for a shrinking sheet were quite different from those of a stretching sheet. Lok et al. analyzed MHD stagnation-point flow from a shrinking sheet. They found that dual solutions existed for small values of the magnetic parameter. The stagnation-point flow over a stretching or shrinking sheet in a nanofluid was investigated by Bachok et al. . They showed that adding nanoparticles to a base fluid increased the skin friction and heat transfer coefficients. Recently, Narayana and Sibanda  investigated the laminar flow of a nanoliquid film over an unsteady stretching sheet. They noticed that the effect of an increase in the nanoparticle volume fraction was to reduce the axial velocity and free stream velocity in the case of a Cu-water nanoliquid. However, the opposite appeared to be true in the case of an Al 2 O 3 -water nanofluid. Kameswaran et al. studied the effects of viscous dissipation and a chemical reaction in hydromagnetic nanofluid flow due to a stretching or shrinking sheet. They found that the velocity profiles decreased with an increase in the nanoparticle volume fraction, while the opposite was true in the case of temperature and concentration profiles. The study further showed that liquids with nanoparticle suspensions were better suited for effective cooling of the stretching sheet due to their enhanced conductivity and thermal properties. Most chemically reacting systems involve both homogeneous and heterogeneous reactions (combustion, catalysis and biochemical systems). The simple combustion model helps us to understand the combustion phenomenon in many complex engineering applications such as in aircraft and rocket engines. A model for isothermal homogeneous-heterogeneous reactions in the boundary layer flow of a viscous fluid past a flat plate was presented by Merkin . He modeled the homogeneous reaction by a cubic autocatalysis process and the heterogeneous reaction by a first-order process. Chaudhary and Merkin  analyzed homogeneous-heterogeneous reactions in boundary layer flow. They presented a numerical solution of the boundary layer equations near the leading edge of a flat plate. Ziabakhsh et al. studied the diffusion of a chemically reactive species into a nonlinearly stretching sheet immersed in a porous medium. Chambre and Acrivos  studied isothermal chemical reactions on laminar boundary layer flow. The two-dimensional stagnation-point flow near an infinite permeable wall with a homogeneous-heterogeneous reaction was studied by Khan and Pop , while Khan and Pop  and Bachok et al. studied the effects of homogeneous-heterogeneous reactions on fluid flow due to a stretching sheet. Recently, the effects of homogeneous-heterogeneous reactions in nanofluid flow due to a porous stretching sheet were studied by Kameswaran et al. . They found that the concentration at the surface decreased with the strength of the heterogeneous reaction. In the case of a shrinking sheet, they showed that the velocity profiles decreased with increasing nanoparticle volume fraction in the case of a Cu-water nanofluid. This article presents a study of homogeneous-heterogeneous reactions on MHD nanofluid stagnation point flow due to a stretching or shrinking sheet. The transformed nonlinear conservation equations are solved numerically. u ∂ b ∂ x + v ∂ b ∂ y = D B ∂ 2 b ∂ y 2 + k c a b 2 .
ρ n f = ( 1 − ϕ ) ρ f + ϕ ρ s .
Physical model and coordinate system. Here, the subscripts nf, f and s represent the thermophysical properties of the nanofluid, the base fluid and nanoparticles, respectively. where ψ = ( U ∞ ν f ) 1 2 x f ( η ) , f ( η ) is the dimensionless stream function and η = ( U ∞ / ν f ) 1 2 y .
u = U ∞ x f ′ ( η ) and v = − ( U ∞ ν f ) 1 2 f ( η ) . δ h ′ ( 0 ) = − K s g ( 0 ) , h ( η ) → 0 as η → ∞ . g ( η ) + h ( η ) = 1 .
g ′ ( 0 ) = K s g ( 0 ) , g ( η ) → 1 as η → ∞ . where Re x = x u e ( x ) / ν f is the local Reynolds number. The system of ordinary differential equations (13) and (23) with boundary conditions (16) and (24) was solved numerically using Matlab bvp4c routine. We considered Cu-water and Ag-water nanofluids. The thermophysical properties of the nanofluids used in this paper are given in Table 1. In order to determine the accuracy of our numerical results, the present results for the skin-friction coefficient f ″ ( 0 ) were compared with the available published results of Jafar et al. , Bachok et al. and Wang  in Tables 2, 3 and 4. Tables 2 and 3 give the coefficient f ″ ( 0 ) for different parameter values. Table 2 gives a comparison of the present results with those obtained by Jafar et al. and Wang  when M = K = K s = Sc = f w = ϕ = 0 , for different values of the stretching parameter. We observe that for increasing λ, the present results are in good agreement with results in the literature. Table 4 gives the values of f ″ ( 0 ) for selected λ when K s = K = Sc = 1 , f w = M = ϕ = 0 . We note here that with decreasing λ the first solution f 1 ″ ( 0 ) decreases while the second solution f 2 ″ ( 0 ) increases. These results are in good agreement with the results obtained by Bachok et al. in the absence of the particular physical parameter. The effects of the Schmidt number, stretching, magnetic and chemical reaction parameters are shown in Figures 2-12. Effects of λ on velocity, when K = 1 , Sc = 1 , K s = 1 , M = 0.5 , f w = 1 . 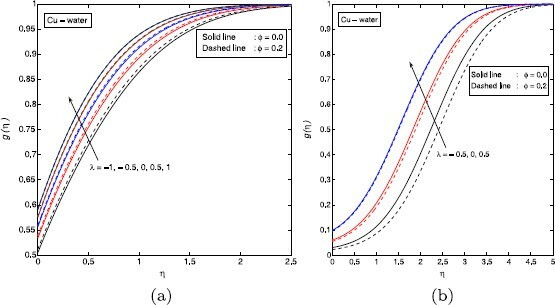 Figure 2 shows the effects of both stretching and shrinking on the velocity profiles in the case of a Cu-water nanofluid. We observe that in both cases, the velocity profiles increase with the parameter λ. Further, we note that for a shrinking sheet, the velocity in the case of a Cu-water nanofluid is larger than that of a clear fluid. The opposite is, however, true for the case of a stretching sheet. The momentum boundary layer thickness decreases as λ increases and the flow has an inverted boundary layer structure when λ < 1 . The findings in the case of a clear fluid are similar to the results obtained by Jat and Chaudhary . 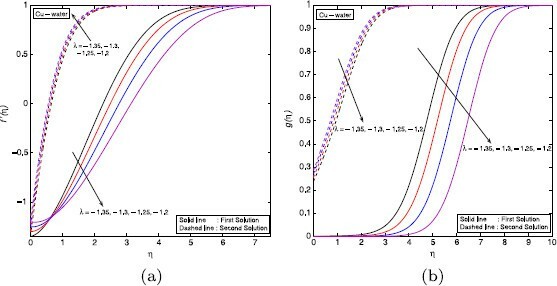 Figures 3(a) and 3(b) illustrate the effect of the magnetic parameter, nanoparticle volume fraction and stretching or shrinking parameters on the velocity profiles. 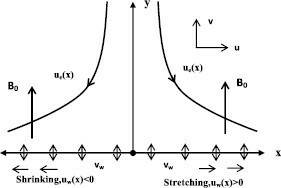 We note that for both stretching and shrinking sheets, the fluid velocity increases with λ and M. Furthermore, increasing the value of M also causes thinning of the boundary layer. This implies an increase in the velocity gradient f ″ ( 0 ) . Thus the magnetic field enhances the fluid motion in the boundary layer in the case of a clear fluid. The same trend is observed in the case of a Cu-water nanofluid. We also observe in the case of injection that, with increasing magnetic parameter, the increment in the momentum boundary layer is more significant than in the case of suction. Effects of M on velocity when (a) K = 1 , Sc = 1 , K s = 1 , f w = 1 and (b) K = 1 , Sc = 1 , K s = 1 , f w = − 1 . Figures 4(a) and 4(b) illustrate the effects of the stretching or shrinking parameter and volume fraction on the solute concentration when K = 1 , Sc = 1 , K s = 1 , M = 2 , f w = 1 . We observe that the concentration profiles increase with the stretching parameter. We note also that the concentration increases as λ varies from λ = − 1 to λ = 1 for both the clear fluid and the Cu-water nanofluid. 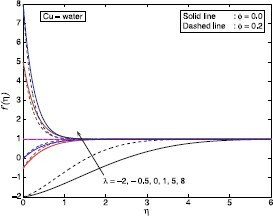 However, beyond λ = 1 , the opposite is true for the clear fluid and the Cu-water nanofluid. Variation of concentration for different values of λ , when (a) K = 1 , Sc = 1 , K s = 1 , M = 2 , f w = 1 and (b) K = 1 , Sc = 1 , K s = 1 , M = 2 , f w = − 1 . The variation of g ( 0 ) for different values of K and K s is shown in Figures 5 and 6, respectively. 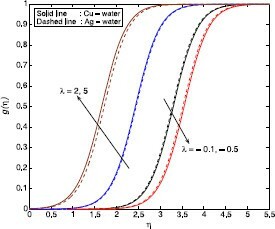 From Figure 5 we observe that the concentration at the surface decreases as the strength of the heterogeneous reaction increases. This is simply explained by the fact that the strength of the chemical reaction depends on the concentration. On the other hand, from Figure 6, we found that g ( 0 ) decreases with increasing K and K s . These findings are similar to the results reported by Kameswaran et al. . Effects of K s and K on concentration, when K = 1 , Sc = 5 , f w = 1 , M = 2 , ϕ = 0.2 . Effects of K and K s on concentration, when Sc = 5 , f w = 1 , M = 2 , ϕ = 0.2 . Figures 7 and 8 show the effects of K and λ on the concentration when the other parameters are fixed. We note, as expected, that the wall concentration decreases as the strength of the homogeneous reaction increases. The level of decrease is, however, more significant in the case of Ag-water than for Cu-water. Figure 8 shows the influence of stretching on the concentration profiles. It can be seen that the concentration decreases when the sheet is shrunk and increases with stretching. Effects of K on concentration, when K s = 1 , M = 2 , Sc = 1 , λ = 2 , f w = 0 , ϕ = 0.2 . Effects of λ on concentration, when M = 2 , Sc = 1 , f w = 0 , K = 20 , K s = 0.5 . 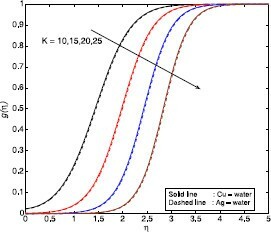 The effects of suction/injection parameter f w on the velocity and concentration profiles are presented in Figure 9 for a Cu-water nanofluid. These profiles are qualitatively similar to the profiles obtained in the case of a clear fluid. Here we note dual solutions, i.e., the first and second solutions. The velocity and concentration profiles decrease with increasing f w > 0 in the case of the first solution. The opposite is, however, true in the case of the second solution. The far field boundary conditions are asymptotically satisfied, thus supporting the validity of the numerical solutions and the existence of dual solutions. In Figure 9(b), the concentration increases more rapidly with increasing suction/injection in the case of the second solution. Effects of f w on (a) velocity and (b) concentration profiles, when M = 0.1 , Sc = 1 , K s = 1 , K = 1 , ϕ = 0.1 and λ = − 1.2 . 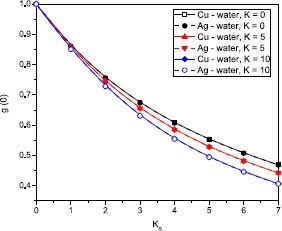 Figure 10 shows the effect of the magnetic parameter on f ′ ( η ) and g ( η ) for both Ag-water and Cu-water nanofluids. The velocity and concentration profiles are higher for Cu particles compared to Ag nanoparticles in the absence of the magnetic parameter. Increasing the value of M causes thinning of the boundary layer. The magnetic field enhances the fluid motion at the boundary, and for clear fluids these results are similar to well-known results in the literature. Effects of magnetic parameter M on (a) velocity and (b) concentration profiles, when K s = 1 , K = 1 , Sc = 1 , f w = 0 , ϕ = 0.1 and λ = − 1.2 . The variation of the velocity and concentration profiles with the stretching/shrinking parameter is shown in Figure 11. The dual velocity f ′ ( η ) and concentration g ( η ) profiles decrease with an increase in the magnitude of λ in the case of the first solution and increases in the case of the second solution. It is to be noted that momentum boundary layer thickness for the second solution is thicker than for the first solution. For the case of a clear fluid, the results are similar to those obtained by Bhattacharyya . We also note that the velocity gradient at the surface increases with λ, which is consistent with the results predicted from the computation of the skin friction coefficient. Effects of λ on (a) velocity and (b) concentration profiles, when K s = K = Sc = 1 , M = 0.1 , ϕ = 0.1 and f w = 0.5 . 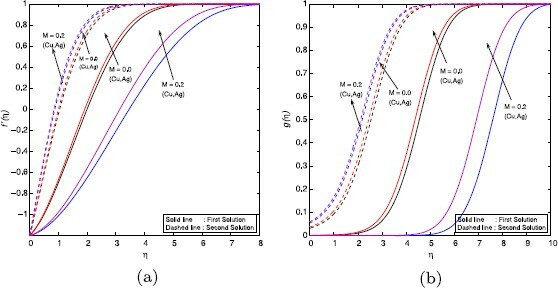 The variation of the reduced skin friction coefficient f ″ ( 0 ) with λ is shown in Figure 12(a). The values of f ″ ( 0 ) are positive when λ < 1 and negative when λ > 1 . Physically, a positive f ″ ( 0 ) implies that the fluid exerts a drag force on the plate and a negative sign implies the opposite. It is evident that dual solutions of equations (13) and (23) subject to the boundary conditions (16) and (24) exist when λ < 0 . There is a critical value of λ c < 0 for which the first and second solutions meet. This critical value depends on the values of the other embedded parameters, and we found, for instance, that λ c = − 1.2465798095 when M = 0 , λ c = − 1.295662771 when M = 0.1 and λ c = − 1.49444085032 when M = 0.5 . These results show that | λ c | increases with M. However, for λ c < λ ≤ − 1 , the solution is not unique, there being two solutions for each λ. Figure 12(b) shows that g ′ ( 0 ) increases with the magnetic parameter M.
Effects of λ on (a) f ″ ( 0 ) and (b) g ′ ( 0 ) , when Sc = K s = k = 1 , f w = 0 and ϕ = 0.1 . The effects of homogeneous-heterogeneous reactions in MHD nanofluid flow due to a stretching or shrinking sheet have been studied. The transformed governing nonlinear differential equations have been solved numerically. Dual solutions for the velocity and concentration distributions have been obtained for some values of the stretching/shrinking, suction/injection and magnetic parameters. The effects of physical and fluid parameters on the velocity, concentration and skin friction have been analyzed. It was observed that for both the cases of shrinking and stretching sheets, the fluid velocity increased with the magnetic parameter. The concentration at the surface decreased as the strength of heterogeneous reactions increased for both Cu-water and Ag-water nanofluids. The boundary layer thickness for the first solution is always thinner than that for the second solution. The authors are grateful to the University of KwaZulu-Natal for financial support. The work including proof reading was done by all the authors.